We’ll come to you! 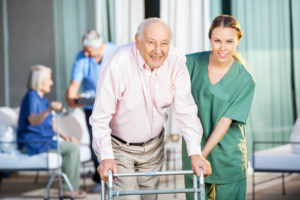 We understand the difficulties associated with transporting elderly patients from their home to their medical appointments. It is often time consuming and dangerous. Elders don’t move around as well as they use to. A minor slip or fall can be detrimental to their health and even life threatening. In-Home Dentures offers mobile denture services in Calgary. Our Denturists are Licensed, professional and have years of experience. Every visit starts with a free In-Home consultation. This can be done at a Senior Home, Retirement Facility, Private Home, etc. There is no additional costs for In-Home services. All appointments are included in the cost of the Denture as well as any adjustments that may be needed. If you or someone you know is in need of Complete or Partial Dentures, Relines or Repairs in Calgary, please give us a call! We’ll be happy to set a free consultation. Prior to any services, a detail treatment plan and cost will be provided to you and your loved one. We also direct bill. In-Home Dentures is the leading mobile denture service provider in Calgary. We have helped many patients get their smiles back at the comfort of their home. We have also partnered with many retirement and senior residencies in Calgary. Let us give you a beautiful smile from the comfort of your home!